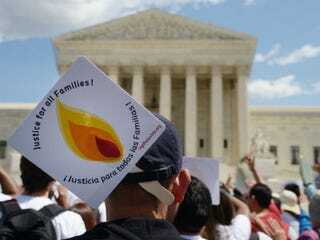 The court ruled that Arizona cannot make it a misdemeanor for immigrants to fail to carry identification that says whether they are in the United States legally; cannot make it a crime for undocumented immigrations to apply for a job; and cannot arrest someone based solely on the suspicion that the person is in this country illegally. However, the court let stand the part of the law that requires police to check the immigration status of anyone they detain, if there is "reasonable suspicion" that the person is unlawfully in the United States. Even there, though, the justices said the provision could be subject to additional legal challenges. The court said it was "improper" for the federal government to block the provision before state courts have a chance to interpret it and without determining whether it conflicts with federal immigration law in practice. The court said it would issue its final major ruling of the term, on President Obama's signature health-care law, on Thursday.